Hasina-Monmohan cry wolf jointly. As they could not eliminate the Mosques and transform the Islamic nation in Deen-e-Elahee, Could not impose Hindi instead of Bangla in Bangladesh. Indian interests are to keep Muslim countries unstable as it needs Bangladesh-Pakistan-Afghanistan under their knees for grabbing wealth. 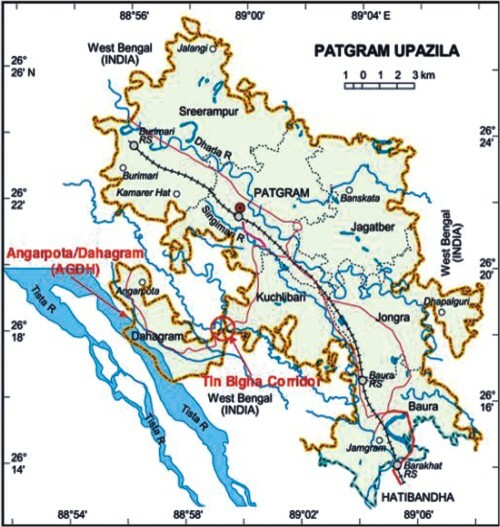 Moreover the rapid growth of Bangladesh in terms of modernization and wealth influences over the North-East border Indian districts. It also bring the Delhi`s discrimination to that huge region too. So, Indian strategy of collapsing Bangladesh becomes their one of prime Military agenda. That matches Indian expansionist design. But the USA-European flows of winds turn for Bangladesh. A slogan, “Let`s eliminate Indian Terrorists in Bangladesh” shines on posters. The Bangladesh administration is controlled by Indian Intelligence-RAW. It already collapsed BDR, weakened Armed-forces. Highest to lowest courts run under the same control. Prime Minister office is treated as RAW regional co-coordinating office. Ministry of Home-Foreign Affairs are directly dictated by the Indian officers. Indian trained Four Lac Eighty six thousand Nine Hundred Sixty (4, 86,960) Fanatic Hindu terrorists are the key fighters that are engaged in Government positions to collapse the sovereignty and Independence at the time sabotage in USA interests. These terrorists are all Indian trained. They instigate the instability of Bangladesh from inside the government. A surprising technique! India has a long history of using terrorists and sending the hordes across borders. It captured Hyderabad, Junagarh and Manvadar illegally through police actions. It forced many smaller states to join the Indian Union by force of arms. It sent its forces to illegally capture Srinagar, using a fake article of accession which it now claims is lost–as if it ever existed. It sent militants to Tibet and Aksai Chin instigating a ferocious attack from China. It sent terrorists into Sikkim, and Bhutan and eventually illegally occupied Sikkim. It sent LTTE terrorists into Lanka trying to bifurcate the small peaceful Buddhist Island. It even tried terrorism in Myanmar and Maldives. It motivated the Hindu youths in Refugee camps, armed and engaged the Mukti Bahinee guerrilla groups across the border into East Pakistan in 1971. It than tried to incorporate Bangladesh using the Rakshi Bahinee after Awami League climbed on the government. Now, Whatever Hasina, Rehana, Sajeeb Joy, Dipu Moni, Sahara and Ashraf are painting as friendlier relation with India is in real annexation procedure with India that the Fakhruddin-Moinuddin-Iftekharinitiated. Obviously, India needs terrorist regiments as Pakistani Army and ISI are rock to them to defeat whereas Bangladesh is so rootless to them that it purchases the pillars as it needs. Indian officers train and control the civil and military officers in Bangladesh. He explained that the Chief of Staff of the Afghan Army had told him that he had gone to India to offer the Indians five bases in Afghanistan, three of which are along the Pakistani border. Gul was asked a question as to why, if the West was supporting the TTP (Pakistani Taliban), would a CIA drone have killed the leader of the TTP. Gul explained that while Pakistan was fighting directly against the TTP leader, Baitullah Mehsud, the Pakistani government would provide the Americans where Mehsud was, “three times the Pakistan intelligence tipped off America, but they did not attack him.” So why all of a sudden did they attack? Because there were some secret talks going on between Baitullah Mehsud and the Pakistani military establishment. They wanted to reach a peace agreement, and if you recall there is a long history of our tribal areas, whenever a tribal militant has reached a peace agreement with the government of Pakistan, Americans have without any hesitation struck that target. … there was some kind of a deal which was about to be arrived at — they may have already cut a deal. I don’t know. I don’t have enough information on that. But this is my hunch, that Baitullah was killed because now he was trying to reach an agreement with the Pakistan army. And that’s why there were no suicide attacks inside Pakistan for the past six or seven months. Bangladesh is in the endgame of destabilization. The Indian trained militants are already positioned to damage and eliminate the patriotic elements and collapse the sovereignty and independence of Bangladesh. The next scene is waiting to appear as it faces challenges. Indian terrorization and collapsing Bangladesh is far different than Pakistan-Afghan battle field in more cases. Of course, the Obama administration has opened a new strategy on Bangladesh and it`s near that the real Bangladeshi nationalists are sourcing supports recently. Ex-Prime Minister Khaleda Zia`s significant visit in Washington DC, NewJersy and New York as the leader of the opposition in Bangladesh National parliament in last week will bring face to face the Indian terrorists and Bangladeshi nationalists in Dhaka. The professionals and Journalists are desperate under the leadership of renowned Journalist Mahmudur Rahman called for up rise to topple down the government. The World super power prefers to see the down fall of the Hasina government soon that`s the observers assumption. India is taken in partnership on Afghanistan and Pakistan sector with NATO and on the other hand the Bangladesh and up to China will be controlled by USA direct. That will come up. টেস্ট কেস হিসেবে হলেও বিজয়ের মাসে কেনো প্রেক্ষাগৃহে ভারতীয় ছবি মুক্তি দেওয়া হচ্ছে? এই প্রশ্নটিই এখন জোড়ালো হয়ে ওঠেছে। একইভাবে যদি ভাষা আন্দোলনের মাস আগামী ফেব্রুয়ারিতে যদি প্রেক্ষাগৃহে হিন্দি ছবি মুক্তি দেওয়া হয়, তাহলে জাতীয় চেতনা বলে থাকলোটা কী! এর মানে কি? ভারতে নারীদের যৌন হয়রানি না করে বাংলাদেশে চলে যাও ওখানে গিয়ে যা করবে তাই জায়েজ! প্রতিরক্ষা উপদেষ্টার অভিযোগের পরও ধরাছোঁয়ার বাইরে মতিউর! রাজনৈতিক বিশ্লেষকররা ক্ষেভের সঙ্গে আরও বলেন, সরকারের প্রভাবশালী ব্যক্তিরা যখন এ ধরনের শক্ত অভিযোগ আনেন তখন প্রথম আলো সম্পাদক আরো বেপরোয়া হয়ে অগ্রসর হন। তখন সঙ্গত কারণেই প্রশ্ন উঠে, মতিউর রহমান কতটা শক্তিশালী? তিনি কি একটি গণতান্ত্রিক সরকারের চেয়েও শক্তিশালী? তিনি কি দেশে প্রচলিত সকল আইনের ঊধর্ে্ব? সরকারের উপদেষ্টা ও মন্ত্রীরা যখন সুনির্দিষ্ট অভিযোগ আনেন, জঙ্গিবাদের সম্পৃক্ততা যার বিরুদ্ধে স্পষ্ট, সেই মতিউর রহমান যদি থেকে যান ধরা ছোঁয়ার বাইরে, তখন সাধারণের মনে অনেক প্রশ্ন জাগাটাই স্বাভাবিক। সরকার তার যে প্রতিনিধিদের নিয়ে দেশ পরিচালনা করছেন, সেই প্রতিনিধিদের বক্তব্য সত্য হলে মতিউর রহমান কেন আইনের ঊধর্ে্ব থাকবেন ? বঙ্গভঙ্গের মাধ্যমে বৃহত্তর ইন্ডিয়ার শোষণ থেকে ১৯১১ সালে আমরা মুক্ত হয়েছি। আর মুক্তিযুদ্ধের মাধ্যমে পাকিস্তানের শোষণ থেকে মুক্ত হয়েছি ১৯৭১ সালে। বাংলাদেশ ও ইন্ডিয়া “একই দেশ” এই কথা বলে কি ৩০ লাখ শহীদের রক্তকে অপমান করা হলো না ? যে ভাষার জন্য ১৯৫২ সালে সালাম, রফিক, বরকত উষ্ণ রক্ত ঢেলে দিল “একই ভাষা” বলে কি সে ভাষাকে কি অপমান করা হলো না ? ইন্ডিয়ার ৮০.৫% হিন্দু , আর বাংলাদেশের ৯০.৪% মানুষ মুসলমান। আমাদের ধর্ম কি এক হলো ? তাহলে বাংলাদেশ ও ইন্ডিয়া কে “একই দেশ” বললে তাকে কি বলবেন ? তুমি অধম , তাই বলিয়া আমি উত্তম হইব না কেন ?